The KU jersey that Andrew Wiggins will be wearing will be the number 22 Kansas Jayhawks jersey. So far, the jerseys that have been up for sale are blue and white. They do not say "Wiggins" on the back because it is actually against a new NCAA rule for companies to sell college jerseys with current players' names on them. What a bummer! You can still get your #22 jersey though. We all know who that is! Pick out your jersey below! You can buy Andrew Wiggins jerseys on Amazon through the Andrew Wiggins Basketball store. Click either of the photos below to be taken to a page that shows each of the available options. Because Adidas is the sponsor of the University of Kansas, all official KU Jayhawks basketball jerseys will be the Adidas brand. 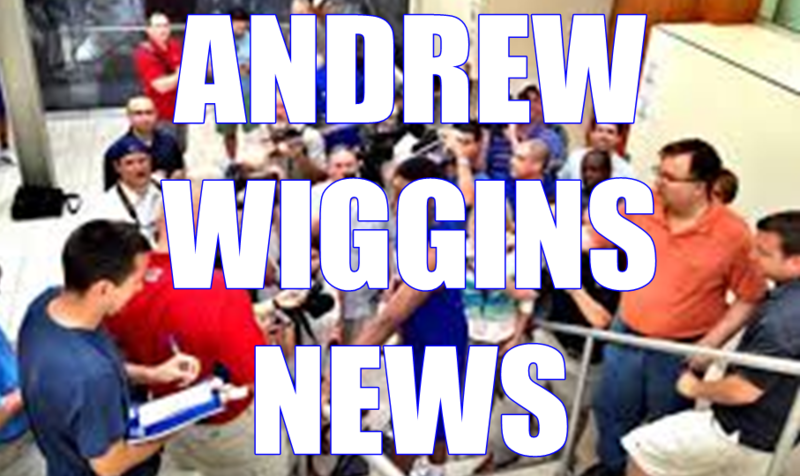 The Andrew Wiggins Kansas jersey in white has blue bands for the arm holes and a blue band collar with the letters "KU" embroidered on the back of the collar. The Adidas logo is in blue on the top left front of the jersey. The word "Kansas" is on the front and a big # "22" in blue lettering with a red outline. The back also has a large number "22" on it. There is a thick blue stripe surrounded by two smaller red stripes going down the sides of the jersey. 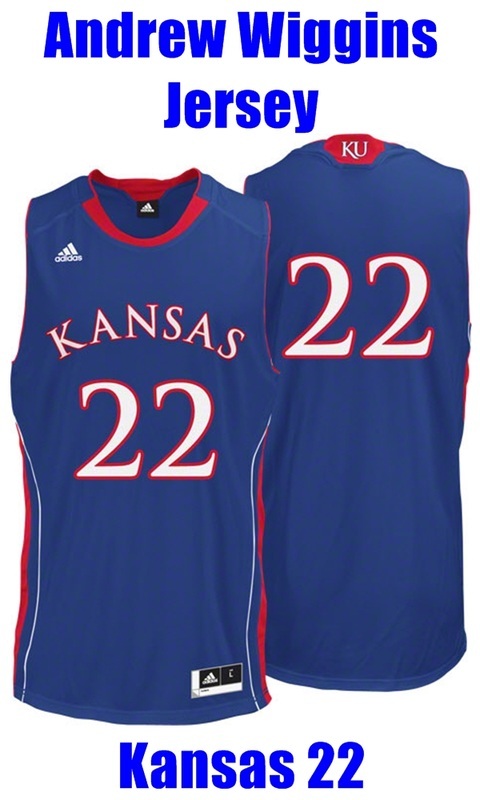 The blue Kansas 22 jersey for Andrew Wiggins has a red band collar and red bands around the holes for arms. The red collar says "KU" on the back. The Adidas logo is in white. 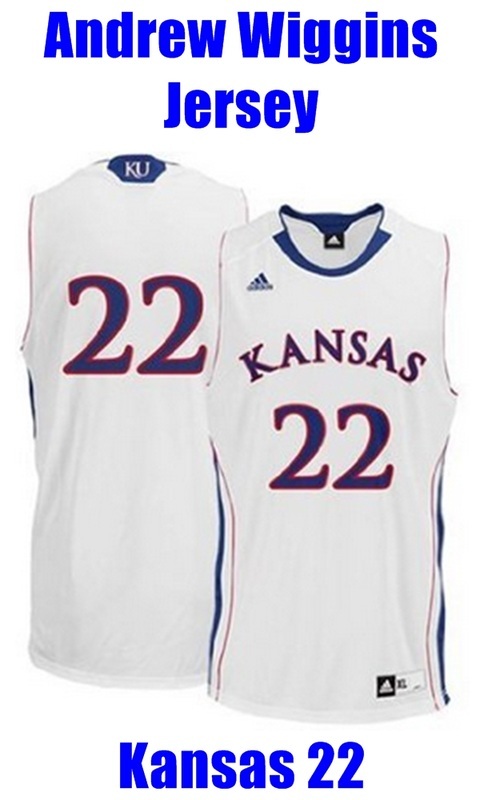 The word "Kansas" and the number "22" on the front and back of the jersey are in white lettering with a red outline. There is a large red stripe down both sides of the jersey that is surrounded by two smaller white stripes. 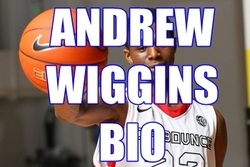 Please note we are not affiliated with Andrew Wiggins or the official site of Andrew Wiggins and we are only a fan site.